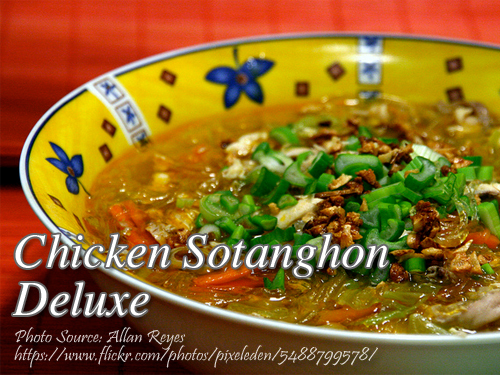 This is a special chicken sotanghon soup where it is served with a pork and shrimp omelet sliced into cubes. Cooking this sotanghon soup is not complicated. You just need to make a nice chicken broth by boiling a whole chicken with quartered onion and some salt. You can use the other parts of the chicken for other dishes. To give you a brief cooking instructions: first you have to make the pork and shrimp omelet by combining eggs, pork, shrimps, flour, salt and pepper. Steam it for 1 hour then cut into cubes. Then soak sotanghon for an hour, dip in hot water, drain and set aside. Boil the chicken breast and ham until tender, fry some garlic, saute onions and add chicken and ham. Add patis, chicken broth and sotanghon. Serve hot. Mix the pork, shrimps, onion, eggs, flour, salt and pepper until well-blended. Heat cooking oil in a pan and add this mixture. Steam for 1 hour. When done, cool and cut into cubes. Boil the chicken and ham. When tender, debone chicken and flake into small pieces. Soak the sotanghon first for 1 hour in water. Dip in boiling water, then drain. Cut into desired lengths. Sauté the garlic. When brown, remove and set aside. Add the onion, flaked chicken and ham. Season with patis and seasoning. Add some chicken broth and then the sotanghon. Garnish with fried garlic and green onions. Serve with cubed pork and shrimp omelet. Thank you so much… dami ko Na tutuhan Na Luto.. God Bless. Hi Ma. June, you are welcome and thanks for visiting this blog!